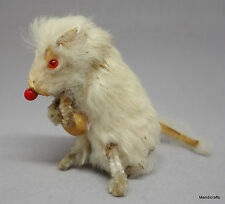 Great miniature genuine rabbit fur skinWhite Mouse byOriginal Fur Toys West Germany. Holding corn kernel. Original blue and whitelabel on base. Pipe cleaner / chenille stem arms/legs. Marked on his paws as shown. 3.5" Bears, made by World of Miniature Bears. Soft adorable miniature bears and animals. If you need the clear box & certificate. FREE Trial ! Not produced with a box.Note: Stand not included. by Boyds Bears. Age Group: Not a Toy - Intended for adult collectors. Stand not included. Group of 25 Pieces! VERY RARE. 1 See-saw w/o base. 2 Chairs with cut out hearts. 3 Scooters. Picture stands are not included. Item will be carefully wrapped. Soft adorable miniature bears and animals. FREE Trial ! Material : Velvet Plush, leather paw no writing. If you need the clear box & certificate. FREE Trial! Color : Panda Black/White. 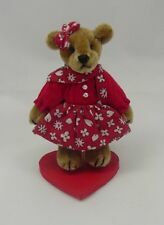 New ListingMiniature Dollhouse Baby Teddy Bear Girl Artisan Sculpted One of a Kind 2-3/4"
Her body is hand sewn with soft upholstery fabric and fully jointed like a teddy bear. Cute brown, white, and black stuffed kitten. Front legs are jointed. The cats are as described below Female cat with pink flower dress holding a bouquet of flowers and wearing a brown sun hat with flowers. Female cat with a pink bikini and red sunglasses. 3 Flocked Teddy Bears! Good condition, clean, no odors. 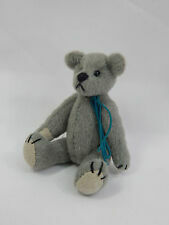 BAYLESS CREATIONS 5" MOHAIR BEAR, Gently Loved! He's been in my cabinet for years. He stands 5" tall, and fully jointed. His hair is a honey color, with hand stitched paws & feet, nose & mouth. this little guy captured my heart & I hope will capture yours. Ganz cottage collectiblesminiature plush bearterry by artist lynda kunz - fully jointed head-arms and leggs,with tiny inserted eyes . Material : Velvet Plush, leather paw. FREE Trial! Barton's Creek Gund Miniature Bear by Kelli Kilby Petals "Pandie Paws"
Fully Jointed, French Embroidery, Suede Paws, Hand Crafted, Hand Painted. It is a light pink color done in longer mohair type material. It is fully articulated. It is also retired. It is a dusty pink / light rose color and SO cute. This bear is jointed at the arms, legs, and has the sweetest face. 4.25” pink mohair jointed perfume bear mint in box coa so cute- great rare find! 3.25" Bears, made by World of Miniature Bears. Soft adorable miniature bears and animals. FREE Trial ! Stay away from little kid. 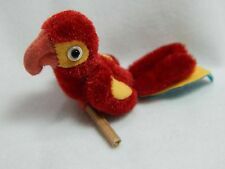 Only 2 1/4 inches tall- jointed. 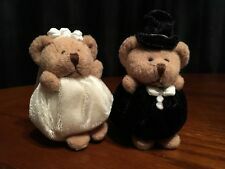 This if for a set of 2 collectibleminiature plush bears - fully jointed arms and leggs,withsewn in faux leather paws and stitched tiny black eyes-nose and mouth. 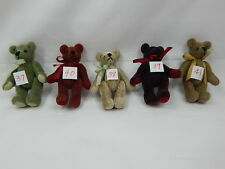 3.25" German Mohair Bears, made by World of Miniature Bears. Soft adorable miniature bears and animals. FREE Trial! 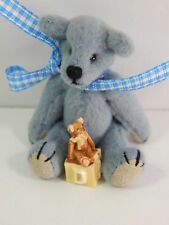 This is a sweet little mohair bear from World of Miniature Bears. His face is so sweet and he has bead eyes. He wears a turquoise painter's smock with paint spatters on it and a turquoise tam. He carries a paint pallet and brush. 2.5" Bears, made by World of Miniature Bears. Soft adorable miniature bears and animals. FREE Trial ! 2.5" Bears, made by World of Miniature Bears. Soft adorable miniature bears and animals. If you need the clear box & certificate. Ganz cottage collectiblesminiature plush bearsteve in his sailor suit by artist lynda kunz - fully jointed head-arms and leggs,with tiny inserted eyes . Size 5" Rabbit, Bunny in a wicker basket. Color : white bunny. Made by World Of Miniature Bears. FREE Trial! I think this bear may have been made from a kit. There is a mark on the back of the head by the artist but I am not sure if he that is. It is very nicely made and in good condition. Or even if you think it is taking too long to get your item. 2.5" Bears, made by World of Miniature Bears. Soft adorable miniature bears and animals. FREE Trial! Item has some shelf wear to case, missing Artist tag. Case stands about 3.25" inches tall. Ships for free first class mail in small box with tracking. Payment is due within 1-3 days. Item ships same or next business days after payment is received. PayPal only, no returns. No e-checks please. International buyers please use the Global Ship Program. If you need alternative shipping options please contact me before buying. Miniature, collectible teddy bear. By World of Miniature Bears. "Precious" - #688; designed by Sherry Dodson. Dollhouse miniature teddy bear. Fully jointed and dressed in PJ's and cow slippers. "Matthew" - #712 - Designed by Becky Wheeler. World of Miniature Bears. Includes COA and protective case.